Versatile, Nesting Chairs Work Great In Your Training Or Reception Area. Mesh Back, Fabric Seat And Armrests Offer Comfortable Seating. Four Legs Include Swivel Casters For Easy Chair Movement. Metal Frame Features A Powder-Coat Finish For Durability. Folding Seat Allows Chairs To Nest For Space-Saving Storage. Weight Capacity Is 225 Lb..
Versatile, Nesting Chairs Work Great In Your Training Or Reception Area. 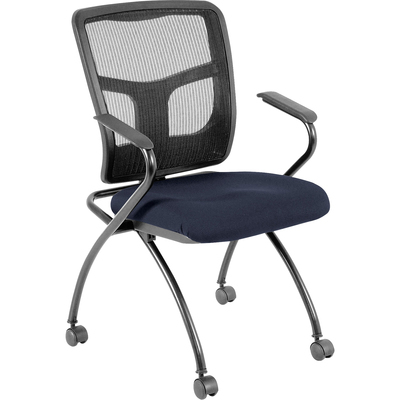 Mesh Back, Fabric Seat And Armrests Offer Comfortable Seating. Four Legs Include Swivel Casters For Easy Chair Movement. Metal Frame Features A Powder-Coat Finish For Durability. Folding Seat Allows Chairs To Nest For Space-Saving Storage. Weight Capacity Is 225 Lb.